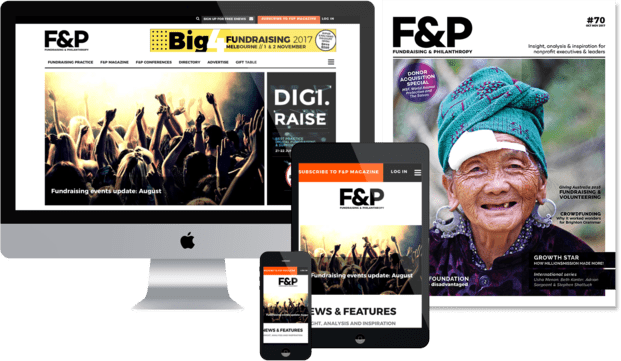 F&P (Fundraising and Philanthropy Magazine) presents five conferences a year that focus on different aspects of fundraising practice. The conferences attract fundraising managers and executives from a range of small, medium and large organisations, and from across the spectrum of different causes and types of nonprofit organisations. The conferences attract delegates from across the Australia/Pacific region. If you are part of the philanthropic community, then the Generosity Forum is a great place to learn and network. Philanthropy is evolving rapidly, and the Generosity Forum brings together a range of sector leaders, experts and practitioners to provide thought leadership, best practice insights, philanthropy case studies, and more. Philanthropists, funders, administrators of trusts/foundations, advisors, social entrepreneurs, impact investors, members of collective giving groups and community foundations, and nonprofit/charity executives. Digi.Raise showcases best practice digital fundraising and supporter engagement. As digital marketing continues to evolve at a rapid rate, Digi.Raise helps delegates keep up to date with the latest trends, practices, case studies and new technology opportunities. If you want to stay on top of the latest in digital fundraising and supporter engagement, Digi.Raise is the place to be. Fundraising managers/executives, digital marketing managers/executives, direct marketing managers. With a focus on direct marketing and individual giving, this conference provides fundraising leaders with a mix of high-level thought leadership, a window onto new and emerging practices, and plenty of practical “how-to” type sessions and case studies from leading organisations in the sector. Key themes are: donor acquisition, donor retention, innovation and integrated campaigns. Fundraising managers/executives, major gift managers, bequest managers, corporate partnership executives, business development managers, trust and foundation executives. Philanthropists, Fundraising managers/executives and event managers.